If the Universe is decent, kind, and caring, these strips of eye of round I marinated for twenty-four hours will be—seven hours hence—delicious, mouth-watering beef jerky. The kind of jerky I used to seek out on long, aimless road trip through Central Texas. 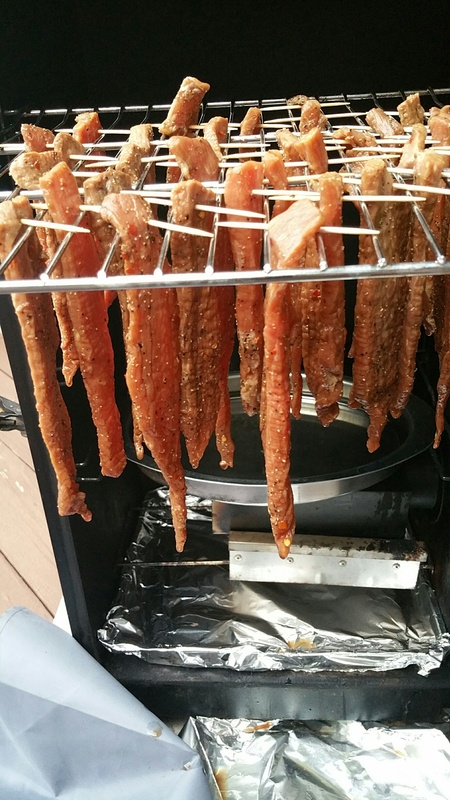 I put these strips of meat in the 170°F smoker, stoked with mesquite chips, a quarter of an hour ago. Soon, the smoker will reveal occasional wisps of smoke, signaling the start of the process of drying and gently cooking the meat. During that time, the aroma of mesquite will meld with the beef and its marinade (sugar, salt, Worcestershire sauce, soy sauce, jalapeño, cumin, garlic, etc.). The result—again, if the Universe is decent, kind, and caring—will be a joyous experience one has no right to expect, but for which one is eternally grateful (if one is fortunate enough to have the process conclude as desired). I may post photos of the result of my experiment. This, my first effort to make jerky, shan’t be my last.